Theyyam, the local folk art of North Malabar, had piqued my interest ever since I moved to south India. 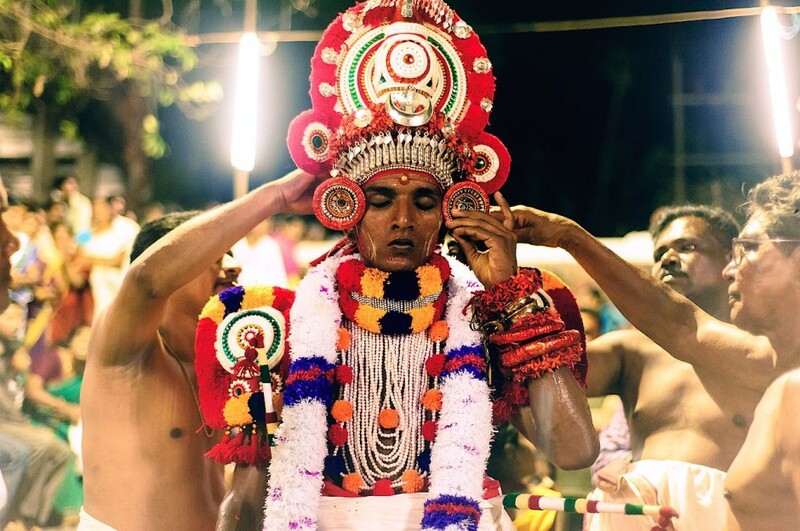 A mélange of dance, music, face painting, and traditional worship, I took it upon myself to explore these and many other facets of Theyyam this spring. The journey unravelled more than just the art form; it gave me a keyhole view to a small chapter in the lives of the artists themselves. 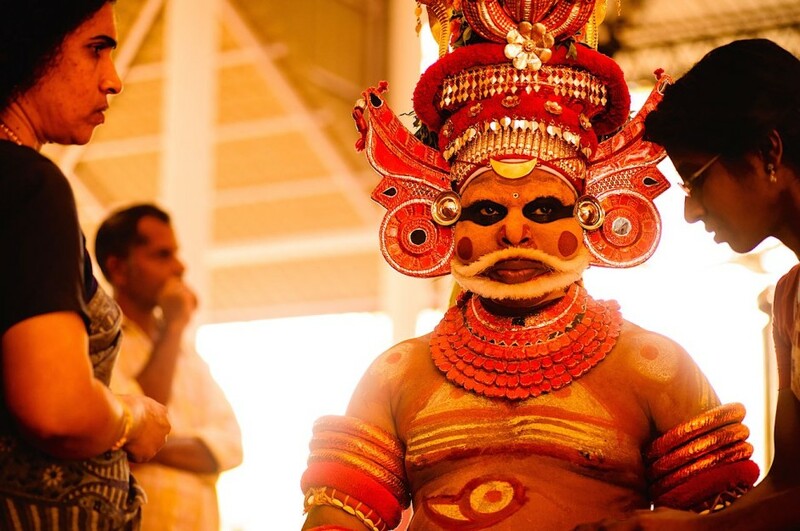 Kannur was the place where one art form, photography, met another, Theyyam. 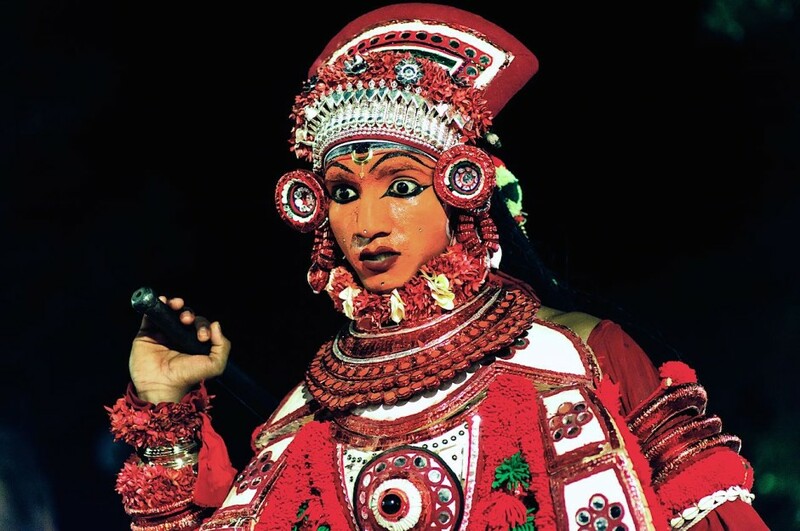 Theyyam is a folk dance form of Kerala, a southern state in India. Theyyams are performed only in temples in northern parts of Kerala, the most popular locations being Kannur, Kasargod and Kozhikode and surrounding areas. Most of these temples are very small village temples, sometimes in ancestral homes. 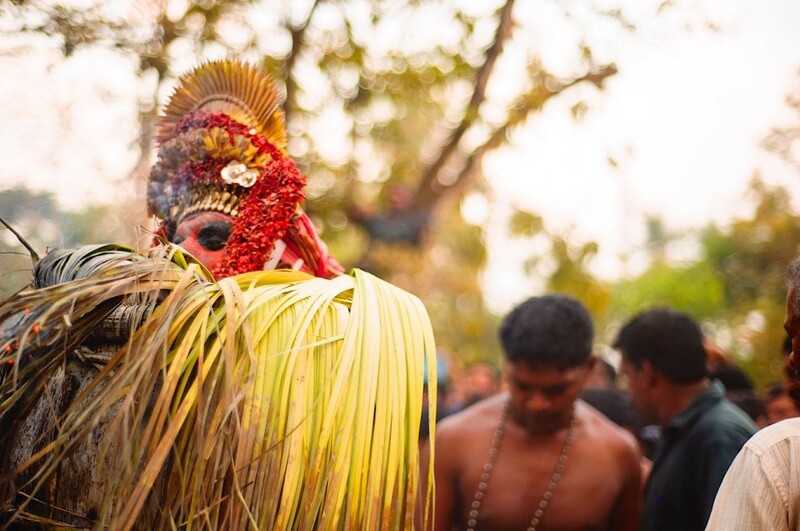 Before getting dressed for the performance, theyyam artists perform elaborate rituals at the village temple or 'kavu' where the performance has to happen. The artists often fast for days before the performance, and prepare their bodies and minds for the event. 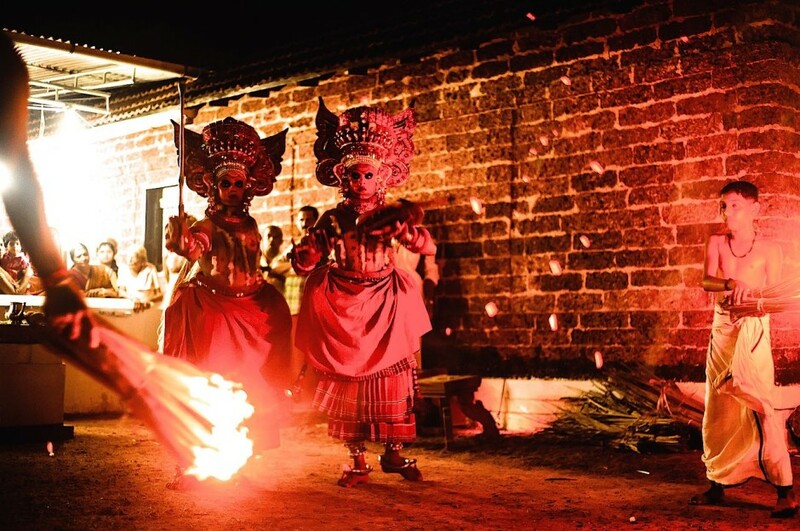 Unlike other dances where the dancers impersonate the gods and goddesses, in theyyam, the dancers are believed to embody the divine energy of the gods and goddesses and are respected by the locals as such. When the performance is about to begin, the musicians play loud music with strong beats, which is audible in all nearby streets and alleys. This is the traditional way to announce the beginning of the event and to invite the audience. People start flocking to the kavu, in anticipation of the dance performance. Since there are often no organized calendars of the events happening in the town, the sound of distant drumming is the surest way to find out where the events are going to take place next. All the dresses, ornaments and head gears are handmade by artists using locally available natural materials like local cloth and coconut fronds. The artists start preparing the costumes several days in advance and work in small thatched huts set aside for the purpose. Sometimes, only the artists are allowed entry into these huts. For the makeup, the artists use locally available, natural coloring materials like turmeric, vermillion, kumkum (processed turmeric), quick lime and rice powder. The make-up takes several hours to complete and can involve elaborate painting on the face with a coconut leaf stem. The feet of a dancer: theyyam artists wear heavy ankle ornaments that jingle and announce the arrival of the dancer from a distance. These anklets are unique to this folk dance form. A theyyam artist gets ready to put on his elaborate head gear. In certain types of theyyams, the head gear of the artists is very high (more than 3 meters), exceeding the height of the temple towers. This requires the artist to perfect a high level of balance during the performance. Some theyyams are performed in stages, and the artist dons different parts of the costume also in stages. 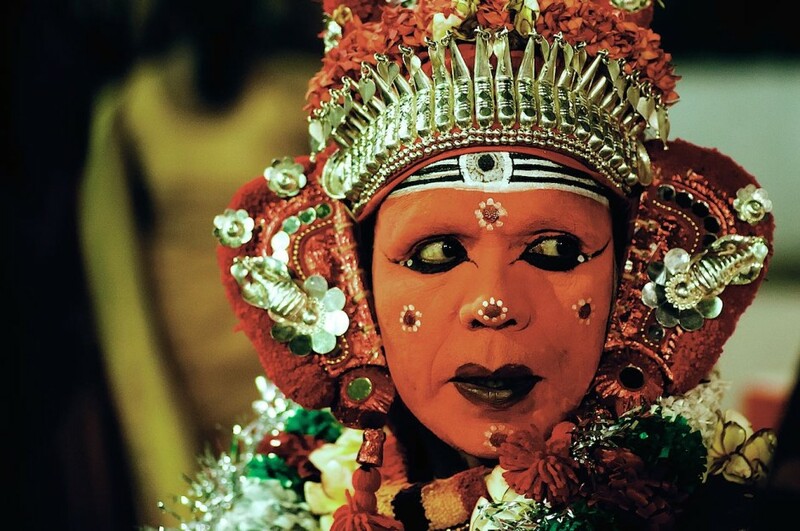 A theyyam artist wears ornaments and garlands in the temple precincts. 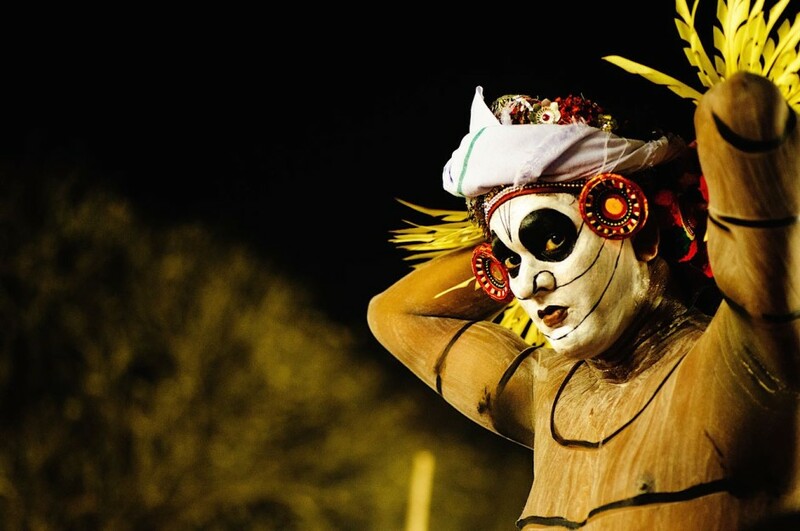 Intense facial expressions and strong body language are characteristic of a good theyyam performance. 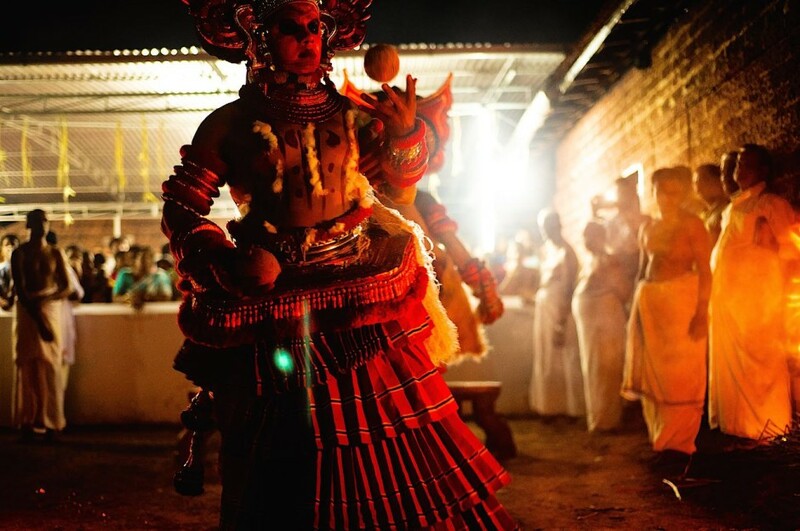 A skilled theyyam artist can easily trigger shock, surprises, fear and awe in his audience, all in one performance. In many of the performances, fire is used to light up the performance space and to create a mystical mood. This method is especially used for the theyyams that happen between sunset and sunrise. Many theyyams continue throughout the night and add to the night life of the town. 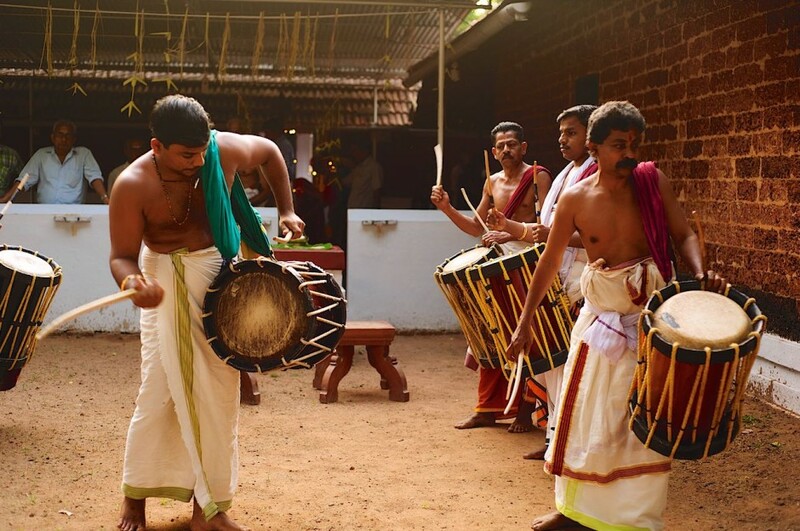 Most of the theyyams performed in the evening involve very fast and energetic movements. The performances show stories from folklore and ancient scriptures. Battle scenes and hunting scenes are high energy with rapid, swift movements and can chill the spines of the audience. The dancers perform in the midst of thronging crowds and often venture into the crowds, keeping them enthralled. 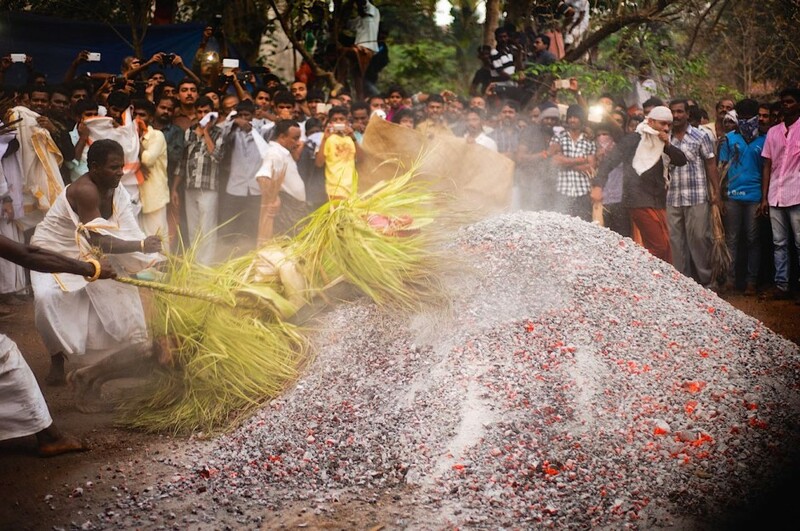 Some of the theyyams involve daring feats such as jumping into a 2 meter high pile of burning coals. These performances thrill the crowds, leaving them in a frenzy. 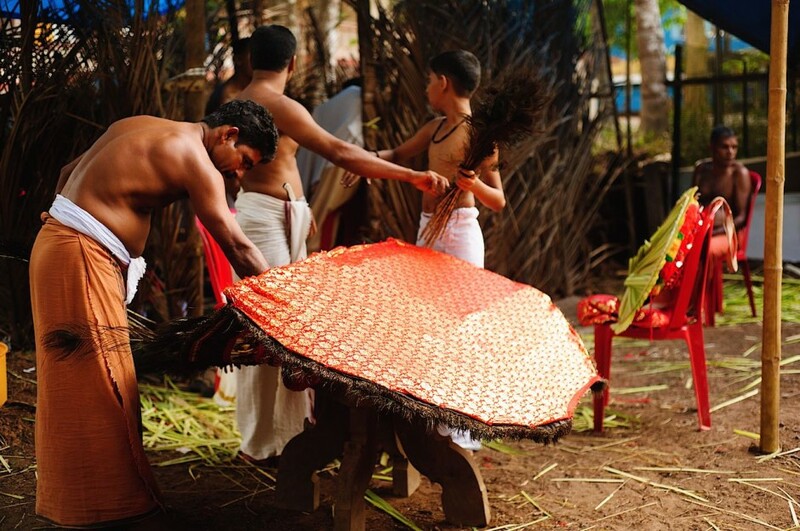 The costume of the theyyam artist is made of coconut fronds and bamboo. Though performing a daring feat that few would even consider possible, the theyyam artist shows no signs of agitation, pain, suffocation or illness. The theyyam artist often undertakes austere mantra chanting and fasting before the performance to prepare himself. During the fire jumping, which is performed not once, but several times, the artist is accompanied by his team which manages crowds, sprinkles water on the ground and removes tossed embers that can hurt people. At the end of the performance, the artist distributes the prasad (a food item as a ceremonial blessing) to the priests, often a paan (betel) leaf. Local villagers seek blessings and counsel from the artists after the performance, as they are believed to embody divine energy.